Riley Ellison has taken a great leap of faith by giving up her comfortable job at the Tuttle Corner library for the exciting world of print journalism. Except that so far it hasn’t been very exciting. All that changes when Riley’s former co-worker Tabitha finds her soon-to-be father-in-law dead, and Riley is asked to write his obituary. 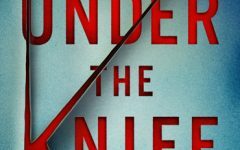 And when they discover Tabitha’s fiancé’s knife sticking out of his father’s chest, Riley finds herself with a murder investigation to cover as well. With mounting pressure from her boss, the mayor, and a bridezilla facing the possibility of a conjugal visit honeymoon, Riley is desperate to prove she can handle the increasing demands of her new job. She ends up blurring the line between reporter and investigator and winning the attention of a very dangerous criminal. Will Riley’s rookie mistakes lead to more than just her byline ending up on the obituary page? My primary goal in this series is to entertain, so I hope this book will help readers escape some of the more serious and consequential news of the day. 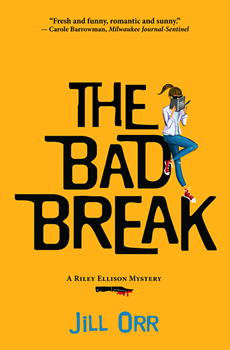 THE BAD BREAK is geared to traditional mystery readers, but will also appeal to the Millennial reader, a demographic that doesn’t read traditional mysteries in great numbers. Part of the fun of writing a series is that you really get to know your characters. I think at a certain point, they start behaving of their own free will and you’re basically just there as a transcriptionist. And because I am not an outliner, I am always surprised to learn who committed the crime, and why. Riley unwittingly signs up to work with a Personal Success Concierge from Bestmillenniallife.com, a life coaching service by Millennials for Millennials. 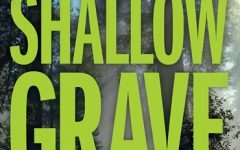 Despite her initial resistance, Riley comes to rather enjoy Jenna B’s pop culture, song lyric, and fortune cookie wisdom–and it even comes in handy as she’s investigating the murder! I love a good mystery and if it’s funny, all the better. So right now, my inspiration is coming from Janet Evanovich, Alan Bradley, Amy Stewart, Darynda Jones, and Meg Cabot. Jill Orr is the author of the Riley Ellison mystery series. She lives in Columbia, Missouri with her husband and two children. Orr is a member of International Thriller Writers, Sisters in Crime, and Mystery Writers of America, and was a founding board member of the Unbound Book Festival.